The chief executive of Metronet, a private firm criticised for its performance in modernising London Underground (LU), has resigned. John Weight is stepping down because the board decided the group "needed to accelerate change", Metronet said. It comes as the London Transport Users Committee (LTUC) called for a review of private maintenance contracts because it said delays "plagued" lines. LU said it was demanding a "marked improvement in performance". The company said the chief operating officer of engineering group Jarvis, Andrew Lezala, will replace Mr Weight who was also Metronet's chairman. A Metronet spokesman said: "The shareholders felt that we needed someone new to bring about change." Brian Cook, chair of LTUC, has called for a meeting with LU bosses. In a letter to them, he said: "On behalf of the passengers we represent, we think the time has come to ask formally whether the level of disruption is such that Metronet and Tube Lines, the infrastructure companies (infracos), can be said to be in breach of their contracts. LU said: "We are vigorously pursuing all the issues with Metronet to ensure that such overruns are reduced significantly." After the resignation, London's mayor Ken Livingstone said: "Metronet's recent performance has been intolerable. We require a step change improvement. "It remains to be seen whether the new management will be able to do what Londoners are entitled to expect." General secretary of the Rail, Maritime and Transport union, Bob Crow said: "The profit-hungry ethics of Jarvis has already led to them being kicked off maintenance contracts on the mainline following disasters like Potter's Bar and Hatfield. "It is unbelievable that Jarvis are now being handed control of the Tube." MPs also criticised Metronet for failing to tackle problems including over-running engineering work and derailments. Tube Lines, the other private consortium responsible for maintaining the Underground under the public-private partnership, has also been criticised for poor performance. In a statement, Tube Lines said it had cut delays on the Piccadilly, Jubilee and Northern Lines. 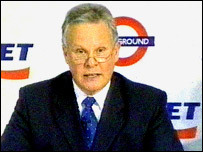 London Transport Commissioner Bob Kiley said: "Today's announcement does not resolve the fundamental issue, which is that London's Tube users are paying the price for Metronet's failure to deliver."